This week’s episode of Doctor Who, The Girl Who Died, is starting in just over twenty minutes on BBC1. We’re almost half way through Series 9 already. It only seems like a week or two since it started! ADDENDUM: So, it’s a two-parter without actually being a two-parter. Two self-contained stories in a prequel/sequel format. Sneaky one, Moffat. Given how good Part One, The Magician’s Apprentice was, I’m really looking forward to tonight’s episode, while hoping that it lives up to the potential of the first one. In general, I greatly prefer two and three-parters to single episodes, as they are less rushed and give a lot more scope for story and character development. However, an unfortunate tendency of the Moffat-era two-parters is that they have great first parts, but slightly disappointing second parts, which almost always fail to live up to promise of the first episode. Here’s hoping that The Witch’s Familiar does not fall into that trap, and turns out to be a cracker. Saturday past gave us the first episode of the new Series 9 of Doctor Who, The Magician’s Apprentice, and a cracking start it was too. Peter Capaldi and Jenna Coleman reprise their roles as the Doctor and companion Clara Oswald, and this first episode alone gave us a cracking story and a whole bunch of guest stars, including Missy (played by Michelle Gomez), Davros (Julian Bleach), and Daleks. Lots of Daleks. How’s that for a great start? In the spirit of avoiding spoilers, I’ll leave a more detailed analysis of the story until a later date. I’ll say only that it was the first episode of a two-parter (unusual in itself, as two-parters are almost always season-enders – I don’t recall any season ever beginning with one), and to say that I’m REALLY looking forward to Part Two is putting it mildly. I hope that it lives up to the first episode, as these two-parters have an unfortunate tendency to start off brilliant in the first episode, but fade away disappointingly in the second. I’ve been going out of my way to avoid seeing any spoilers on the internet, on TV or in magazines, which can be incredibly hard to do, especially when you spend as much time online and read as many magazines each month (including Doctor Who Magazine) as I do. I’ve been trying to come to the new series knowing absolutely nothing in advance, for maximum impact and surprise. Until I saw it on television, I knew absolutely nothing about the first episode, other than it had the Doctor, Clara, Missy and the Daleks. I don’t want to know the storylines or synopses in advance. So I’m trying to avoid anything like that like the plague. Anyway, here’s a listing of the episode titles for Series 9, with zero spoilers. Roll on Saturday and The Witch’s Familiar! Doctor Who Series 9 Starts Today! I’m looking forward to the rest of this evening, just sitting here, eagerly awaiting the start of The Magician’s Apprentice, the very first episode of the new Series 9 of Doctor Who, which begins very shortly, at 7:40pm, on BBC1. Peter Capaldi and Jenna Coleman return as the Doctor and Clara, and I won’t give away much, other than to say that this one features both the Daleks AND Missy/The Master, and the Doctor goes missing, leaving Clara forced to do the almost unthinkable – team up with Missy to find him! So it should be pretty interesting, to say the least. 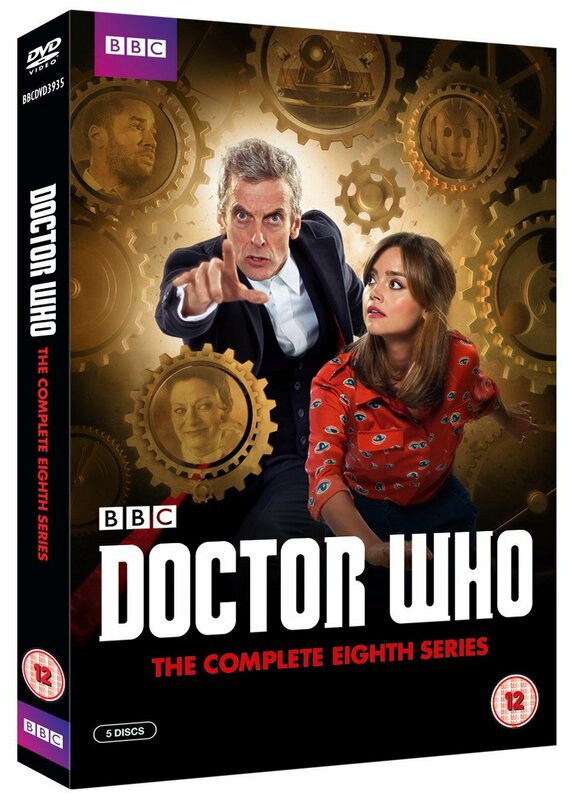 I’ve just recently gotten my hands on the Series 8 DVD Box Set of the new Doctor Who, and I’m about to give it the once over. I’ll be posting my opinions here, quick, general impressions first, followed by more in depth thoughts on each episode as I watch them. I’ve only ever seen these episodes once, back in 2014, when they originally aired on BBC One here in the UK. I recall being quite impressed with the performances of Peter Capaldi in his first season as the Doctor, and companion Clara Oswald, played by Jenna Coleman. I also remember liking most of the the twelve stories (although some more than others), with the exception of The Caretaker, which I didn’t see at all first time around for some reason or another. It’ll be interesting to watch The Caretaker for the very first time, and. I wonder if my opinions of any of the other eleven episodes will change on viewing them second time around. I’ll be making comments on individual episodes in a follow-up post, but here is a listing of the total contents of the box set. There are five discs in all, which should provide a lot of good viewing for several evenings at least. Further comments will be coming soon, as I actually watch the contents. Doctor Who Back on UK Television! Like every other Doctor Who fan on the planet, I’ve been eagerly awaiting the start of the new season, and most of all the first full appearance of the new Doctor, Peter Capaldi. Now at last, Doctor Who returns to UK television tomorrow, Saturday, 23rd August, at 7.50pm, in a 75-minute feature-length episode. I’ve always been a huge fan of Matt Smith and his portrayal of the Doctor. Starting off as a relative unknown, he took to the role like a duck to water, and he has been, without a doubt, a huge success as the 11th Doctor. He brought us a zany, eccentric, manic, and often truly alien version of the Doctor that reminded me most of Tom Baker (on speed), which can never be a bad thing as far as I’m concerned, as TomDoc has always been my favourite Doctor of all. By adopting some of the best elements of not only Tom Baker, but also other previous Doctors (there’s a lot of Patrick Troughton in there as well), combined with his own natural hi-energy craziness, Smith created a new persona which really appealed to me in a “he was born for the role” kind of way. I absolutely loved him, which came as a big surprise to me as I was really apprehensive back when he first took over from David Tennant. Even in the less notable episodes, he lights up the screen and he makes even the worst stories watchable, even if only to enjoy Smith doing his thing. So Peter Capaldi has a lot to live up to, although I’m sure he’ll be more than up to the job. He’s an accomplished actor, and has been around for a long, long time. He’s also a lifetime Doctor Who fan, and has been since he was a young child. Or at least he was an obsessive fan of the classic series (I’ve no idea what he thinks of the new series), from the beginning with William Hartnell, right on through to the fourth Doctor, Tom Baker. So this bodes well for the show, in my opinion. I’m actually looking forward to this older, darker Doctor, and to seeing how he works with the current companion, Clara (Jenna Coleman). Roll on Saturday evening, 7.50pm! This month marks the 50th Anniversary of my all-time favourite sci-fi television series, Doctor Who. The very first episode of An Unearthly Child aired on BBC1 at 5.15pm on Saturday 23rd November, 1963, and the world of sci-fi television, and our lives, would never be the same again. There has obviously been a lot of recent activity to celebrate the anniversary. The November issue of Doctor Who Magazine is of course a bumper 50th Anniversary special, with some truly excellent and detailed behind the scenes articles and a few other nice bits ‘n’ bobs. There have also been various television programs celebrating the lead-up to the anniversary. Last Thursday (14th November) gave us the excellent The Science of Doctor Who on BBC2, featuring the ever-brilliant and entertaining Professor Brian Cox, the Doctor himself (Matt Smith), and various other celebrities from the worlds of science and entertainment. Monday 18th also gave us the bumper two-hour The Ultimate Guide to Doctor Who on BBC3. However, as much as I might be looking forward to The Day of the Doctor, there’s something else that I’m looking forward to even more. Tonight, at 9pm, BBC2 is screening An Adventure in Space and Time, which promises to be an absolute gem. Sure, the 50th Anniversary Special is wildly anticipated by all Doctor Who fans, myself included. But Doctor Who specials come and go, and there have been quite a few of them over the years, some good, some not so good. There has never been a Doctor Who programme like An Adventure in Space and Time on television before. It is a “first”, and, as such, is, in my opinion, even more important than the 50th Anniversary Special itself. I consider it to be the most important Doctor Who production of recent years. An Adventure in Space and Time is a prestigious television drama portraying the origins and earliest behind-the-scenes developments of Doctor Who and the Hartnell-era cast. It’s written by the irrepressible Mark Gatiss, and stars excellent character actor David Bradley as William Hartnell, major Hollywood star Brian Cox as Sydney Newman, and a cast of excellent young British actors including Sacha Dhawan as Waris Hussein, Jessica Raine as Verity Lambert, Jamie Glover as William Russell, Jemma Powell as Jacqueline Hill and Claudia Grant as Carole Ann Ford. This coming Saturday, 30th March, at 6.15pm, sees the return of Doctor Who to UK television screens, as we finally get to see the first episode of the second half of Series 7, The Bells of Saint John. I’m really looking forward to the start of this sequence of new stories, as is, I’m sure, every other Doctor Who fan on the planet. As far as I’m concerned, Matt Smith has been a huge success as the 11th Doctor. His zany, eccentric portrayal combines the best elements of previous Doctors, but is influenced mostly by my favourite Doctor of all, Tom Baker, which has to be A Very Good Thing (at least in my book). Even in the Doctor Who stories which are… let’s say… not exactly the best, Smith puts in a performance that is rarely less than excellent, and, by sheer acting ability alone, often elevates the quality of those episodes beyond that of the mediocre scripts. I’m also looking forward to seeing how he works with his new companion, Clara Oswin Oswald (played by Jenna-Louise Coleman). We’ve already seen her a couple of times before, firstly in last season’s Asylum of the Daleks, and then in the last Christmas Special, The Snowmen. She’s already died twice, but keeps coming back, which bodes well for some intriguing story and character development in coming stories. From what we’ve seen so far, Jenna-Louise Coleman is an excellent young actress, and Clara Oswald should more than ably fill the shoes of The Ponds as the Doctor’s new companion. But most of all, and I’m sure many Doctor Who fans will empathize with me here, I’m looking forward to the monsters. Yes, the monsters! What adversaries, both old and new, will the Doctor be facing this year? I’ve caught the trailer on TV a few times over the past week, and I’m pretty excited about it. The Cybermen are back, looking better than ever. But what excites me the most is that we’ll at last be getting to see the Ice Warriors, the very first time they’ve appeared in the new series. The Ice Warriors have always been one of my favourite classic Doctor Who monsters, right up there with the Daleks, Cybermen, Autons, Silurians, Sea Devils and Zygons, and it’s long, long past time that they made an appearance in the new series. They look absolutely amazing, at least from the brief glimpse that we got of them in the trailer. I don’t know which episode of the new season the Ice Warriors will appear in, but I can’t wait to see them. Hopefully Moffat and co. will do them proud with an excellent story. Roll on Saturday evening, 6.15pm!